Sony/BMG recording artist Josh Ritter, about whom you may have read in previous posts at Ez Sez, has written you a very special Ez Sez welcome letter. I hope you'll take a quick moment to read Josh's words about Montreal bagels, Leonard Cohen and you guessed it... EzSez.com. You can read Josh's letter by clicking HERE. You'll also get a link at that page to enjoy to his acclaimed new CD for free. I've heard it many, many times and it's incredible. I think this may very well mark the beginnings of the renewal of Western civilization. The world needs to know more of what is in the mind of Ezra Soiferman. Say it loud Ez, say it strong! So if I've got this right, Ez is saying at ExSez is that Josh Ritter has something to say. 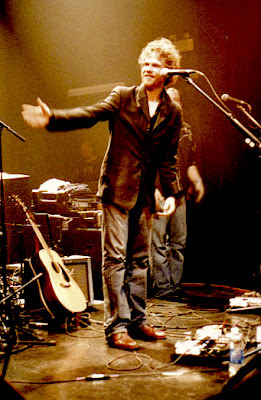 What Josh Ritter is saying is that he likes Ez and that we are welcome to visit EzSez.com to learn what Ez has to say. Is that all... Am I missing something over here? You are right! It's all good news and circular reasoning (and vibes) here at Ez Sez. Stay great and thanks for visiting. May Western and Eastern Civilization live on. Wow. I mean, WOW! When you said that the Josh's letter would be 'very special' I did not imagine that it would the THAT special. A very enjoyable read indeed. Now that you've gotten him on board the Ez train, be sure to get a photo with you beside him for your web site. Associating yourself with the fame and accomplishment of others will only serve to boost your own career and the esteem you're held in by the people's who's opinion of you you care about. Thanks, Matt. I can't wait to get a picture with you too! Glad you liked the letter. I think it's pretty great that Josh Ritter is doing so much to help his friend Kate battle cancer. Will you post the link to her site again either here in the comments or on your main page, so people know where they can donate to help with her medical expenses if they are so inclined? Much appreciated! And thanks for being part of helping Kate too! And you're right about being grateful for the Canadian health care system. We complain about it being a bit slow, but at least it's there and it's there for all.